WESTBURY, NY--(Marketwired - July 21, 2015) - Spectronics Corporation's OLK-400EZ-E Complete EZ-Ject™ Leak Detection Kit contains everything needed to pinpoint refrigerant leaks in small to medium size AC&R systems, including high-pressure R-410A systems. Due to the high cost of refrigerants, equipment repair, the time and effort needed to locate multiple or elusive leaks and proper preventive maintenance of refrigeration systems, fluorescent leak detection is essential for all AC&R systems. Simply add a small amount of dye to the system and let it circulate. The dye/oil mixture escapes with the refrigerant. When scanned with a high-intensity Spectroline® leak detection flashlight, the leak will glow brilliantly. This method can also be used as part of a comprehensive maintenance plan, in which the dye is added to a system before a leak occurs. If a fluorescent glow appears, the leak(s) can be repaired, right on the spot! 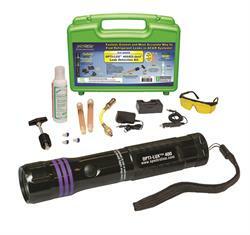 Featured in the EZ-Ject™ kit is the OPTI-LUX™ 400, a powerful, rechargeable violet light LED leak detection flashlight. It emits less visible light compared to standard blue light inspection lamps, so all AC&R leaks are easier to spot. The flashlight has power comparable to high-intensity 150-watt lamps and an inspection range of 25 feet (7.6 m) or more. Also included in the leak detection kit are the EZ-Ject™ dye injector, two multi-dose 0.5 oz (14.8 ml) universal-POE dye cartridges, a hose assembly with check valve and low-loss fitting, a purge fitting, an 8 oz (237 ml) spray bottle of GLO-AWAY™ dye cleaner, three drip plugs, an AC-DC charger and fluorescence-enhancing glasses. All components are packed in a rugged carrying case. Each dye cartridge treats up to 2 gallons (7.6 L) of lubricant, 25 lbs (11.3 kg) of refrigerant or 12 tons of cooling. For more information, call 1-800-274-8888. Outside the U.S. and Canada, call 516-333-4840.